Came across this website as I meandering through my personal memory lane. I was a regular on Sat and Sun night in the early sixties The Garret, sang on multiple occasions with two different guys, and actually was part of a trio called The Garret Singers that Terrea asked us to form, which we did several times, but one member, my partner, backed out and to my knowledge, Terrea never pursued doing anything with it. If any of you know my name, or Jack Machold (my first singing partner) or Noel Boykin, my second singing partner, I would like to hear from you. My apologies to anyone who received spam email pretending to be from this eddress. Of course, I didn't send it. I only know about it because a few of the messages bounced and came back to me. Unfortunately, due to the nature of the Internet, there's nothing I can do about such incidents. They happen from time to time. Please be sure your spam filters haven't added us to their black lists. I'm selling my record collection soon, and am creating a data base for over 1,000 records. I recently found a red label "Terrea Lea at the Garrett". The record is slightly worn (maybe VG-), but still plays well. If someone wants it, I'll part with it for $20 plus shipping. You can reach me at 702-306-1534. I was a student nurse at LA County General Hospital in the early 60's. Saturday nights at the Garret provided a breath of fresh air in my stiffled life in those days. I'll never forget the friends I met there. I'd love to reconnect with anyone who still remembers me and would like to take a trip down memory lane. Thanks to the webmaster for providing this connection. I'll be buying some tunes and a mug to keep the memories fresher from now on. I have not looked for the Garret since I left L.A. in 1967, I see Judy Goldman, Sheridan Littlefield and Tony Mafia's names but I did not see BJ's brother listed. My Tony Mafia painting and drawings are in good shape. A song on NPR reminded me of you and I sat down and looked for you. I live in Chapel Hill, NC which has lots of music....and I am very happy to see your website and read about everyone. Hugs to all, one extra for BJ. Take care. What a rush. I had the red LP "Terrea Lea at the Garret" for many years before it got lost in one of my moves. I can still hear the expresso machine. 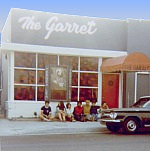 I grew up in the valley and most of my dates, once I began to drive, either started or ended up at The Garret. As a young boy my mother took me to the Garrett in late 50s. Your performance inspired me to a lifelong love of music and a stage career of my own, spanning the 60's, 70's and 80's, playing small to medium stages all across New England. I can still hear you singing 'They Call the Wind Mairah'. place. Nothing like it exists in Seattle where I live now. Thanks for having this wonderful website! What a beautiful tribute you've created. I am a bit jealous of this wonderful experience you have shared. Bless you for bringing this to us who missed it. Enjoyed surfing around your site! I was given some artwork over the weekend and among it was an etching that my aunt did of Terrea that ended up on the Garret House Album. Nancy McMickle is my aunt and I'm sure will enjoy the mug I ordered for her at cafe press! I played the first time on a stage with a guitar at the Garret hoot. I was in my teens, in the sixties, and thank everyone responsible for this website. I am still a musician, and have sent a couple of emails to old fellow hoot participants. I well remember sitting around the fire with good friends and listening to each other, as well as to Terrea. Thank you, Terrea, from one you would not remember. You can go back, to a degree, I suppose. And nobody here has mentioned the very good performances on hoot night of Rik Elswit. He inspired me as well. I could barely play a few chords when I first went to The Garret. In a short time I became a pro sideman (beginning with Rik, et al). Getting old has its drawbacks, but the memories of having lived in such a time and the many hours of wonder spent on Fairfax at the Garret are of unquantifiable value. I owe my career, such as it is, to the place I first nervously stood at a mic with a guitar. Over the years I have often remembered the all too few magic evenings that I spent at the Garret, and have been pained by the thought of my Terrea Lea album that bent out of shape on the hot seat of my car many many years ago. Terrea, Bud and Travis are responsible for the fact that folk music is still my favorite of all. I finally decided to check the web, and here you are. Wonderful! I am looking forward to receiving the album that I just ordered. Thanks for being here and bringing back great memories. Last evening for some unknown reason I was trying to remember the name of the Coffee House I frequested in the early 60's. Upon waking this morning it came to me. The Garret! In 1962 as a 16 years old westside girl and getting a drivers license provided the opportunity for adventure! We loved going to The Garret, the music, the performers, and the people. How great to learn that others share the memories of a less complicated time and place. been for the Garrett. Thank You So Much. Hi to everyone. Can't believe that I found you! The Garret was the most special place in my life. The great people and the life lessons learned there stay with me today. Seeing the pictures brought back memories that I have tried to relate to others in my life but no one that lived it can truly appreciate the impact of the "people of the Garret". Terrea, BJ, Sue and Stacey had tremendous impact on how I lead my life and who I became. Thank you all. The loss of BJ and Sue is very sad news. But the joy of seeing names like Terrea, Jerry and Fran is just amazing. I currently reside just outside of Niagara Falls, NY after retiring from the United States Navy with 22 years of service. I retired as a Lieutenant Commander in the Medical Service Corps. My life has taken many twists and turns but my life and times at the Garret remain with me forever and are the happiest of all. To all of you "Thanks for the memories". I could not believe it when I found this site...what a trip down memory lane. I worked at the Garret in 1961 & '62. I started as a dishwasher, that only lasted about a month, a waitress quit and I took her place. At that time there were three waitresses. Soon after another one quit and Sue and I told B.J. & Terrea we could handle the job, just the two of us. We split it down the middle and we would trade sides each week. I think B.J. had faith in us and we did not let her down, we did handle it! I knew and loved them all...Terrea,B.J.,Sue,Liz,Gretchen & Stacey. At one point B.J. & Terrea decided to turn the house that sat behind the Garret into an Art Gallery. The last tenant that lived in it had painted all the walls black. I said I would clean it up, which even meant hauling off junk, and paint it white... I think it took about 3 or 4 coats of paint but it ended up white. I even moved a refrigerator by myself so I could paint behind it. When Terrea came in and saw that, I got a loving scolding. The guys that were helping me haul off the junk could not back the big truck dawn the narrow driveway, so I did and got a pat on the back and a big smile from B.J.! I have so many stories and loving memories of my time at the Garret. I am sadden by the passing of both B.J. and Sue. I awhile I shared a basement apartment with Sue and she used to loan me her 1950 Ford to drive until I got on. When I first started working at the Garret B.J. found out I had been sleeping in my car for about a week, had no money for an apartment, she gave me a key to the door of the Garret and an electric blanket and pillow and said you know where the food is. What a wonderful family I fell into. I'd like to get in touch with Terrea. I even used to dance on the big round table while the guys jamed. I went on to study Television and work in the Industry as a Producer and Director. I now am retired and live in Rogue River, Oregon. Georgia Roser, then. aka Tracy Betancourt, now. Copyright © 2001-2011. All rights reserved.